Longwood’s online MBA programs have been ranked by GetEducated.com on their “Best Buy” AACSB Online MBA Degree Ranking. Longwood’s online MBA programs include concentrations in general business, retail management, and real estate. The Longwood online MBA programs were ranked number 31 among the 93 business schools that were surveyed. GetEducated.com determines its rankings by comparing the tuition and online learning fees for each of the 93 AACSB accredited universities that offer an online MBA. In order to appear on the list as a “Best Buy” for online learning affordability, the program must cost less than $37,011, which is the average cost of an online AACSB MBA according to GedEducated.com’s comprehensive national survey. 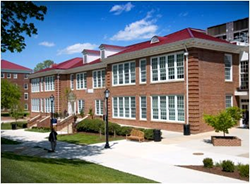 Longwood’s online MBA programs include concentrations in general business, retail management, and real estate. The concentrations in real estate and retail management are probably the only online MBA programs in those areas in Virginia and among only a few online programs in the country accredited by AACSB International, the most prestigious accrediting agency for schools of business. Longwood’s online graduate business programs were ranked 62nd nationally, among 239 such programs, by U.S. News & World Report in its 2014 Rankings of various online college programs released Jan. 8. Longwood University is Virginia’s third-oldest public university and is celebrating its 175th anniversary during the 2013-14 academic year. For more information on the anniversary, please visit 175.longwood.edu. Longwood’s College of Business and Economics, accredited by AACSB International, prepares effective and successful business leaders by guiding students to develop their full potential. A dedication to leadership values and ethics builds upon Longwood University’s mission to develop citizen leaders. The college’s required and outstanding internship program ensures that all students practice their business skills and apply their knowledge in the real business world. The College of Business and Economics offers the Bachelor of Science in Business Administration, Bachelor of Science in Economics, and a nationally-ranked online MBA degree.